21 January 2011 My heart sank. The stern-faced German Frontex officer immediately reached beneath the passenger seat in our rented car where I had tried to hide my video camera. He and his female colleague then scooped up Maro’s cameras, and started going through our footage. Maro, the photographer I was with, and the 70-year-old Greek man were talking heatedly with the female officer in Greek. Whatever they were saying didn’t improve the situation because soon we were all driven to a police station in the small town of Orestiada, a few miles from the Greek Turkish border. When we got to the police station, I groaned quietly as we were taken to the head of police for North Evros, Georgios Salamagkas. The day before he’d given me an extensive interview about the situation in his region, where the number of irregular migrants jumped from 3,500 in 2009 to a massive 36,000 last year. When the interview ended, he asked, ‘you come all this way for that?’ Then puffing on his cigarette, he showed me the contents of his hard drive (pictures of dead migrants being fished out of the River Evros). And now I’d broken the rules by getting too close to the border, which as well as being one of the last remaining sites of historic tension between Turkey and Greece, was the frontline of the battle between Frontex (the EU’s border police) and desperate people trying to get to Europe. We arrived in Nea Vyssa, the tiny village where we were arrested, at around half 7 in the morning hoping to see newly arrived migrants. Instead we spent a few hours chatting to locals, who were full of tales about the Pakistanis (local name for all migrants) they had met over the years. “They are coming here wet and ready to die,” says Mr Fouglias, Nea Vyssa’s baker. “They are poor. They come because they think they will find something better.” Another lady remembers when her neighbour woke up to find 20 Pakistanis hiding in his garden. We were about to leave when we met an old Greek man called Mr Housidis, who insisted on taking us to see the River Evros, where most migrants enter Greece. It’s very close, he said, as our tiny rental car struggled over the rough track leading away from the village to the border. I was glad we were in the car and not walking. 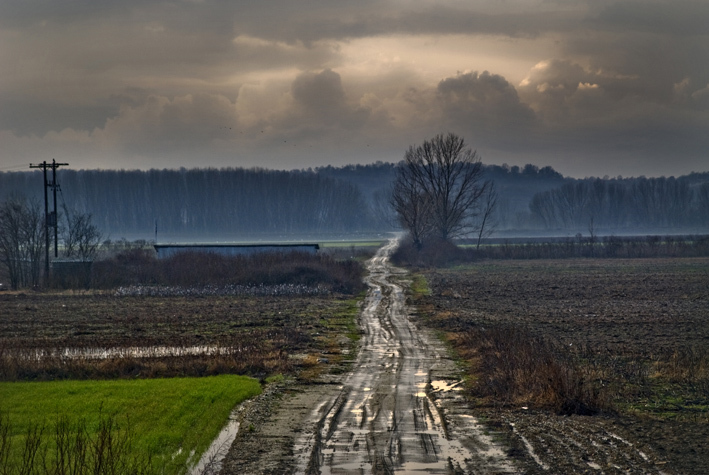 There was no road or path, just a barely marked track full of large ditches of muddy water, surrounded by asparagus and wheat fields. Every few hundred metres, there was a tiny brick shelter for farming equipment. Migrants sometimes hide in those places, says Mr Housidis, and in the morning they are found frozen to death. The track from the border is about 5 to 6km from the centre of Nea Vyssa. Migrants crossing the border illegally often take this route at night or very early in the morning. At the police station, there is a lot of shouting going on, all in Greek. Mr Housidis gets the worst of it. Later Maro tells me the officer yelling at the old man was fed up because it’s not the first time villagers have led journalists to military restricted areas. Mr Housidis is defiant. But there is a man in the village who fishes there all the time, he says. He always brings back huge fish. He expands his arm to show just how big. The officer looks exasperated and I try not to giggle as Maro whispers translations to me. Eventually after various images are deleted from our cameras, we escape the fate of some German reporters arrested only days before and are set free. We drive Mr Housidis back to his wife, who has his lunch waiting. “It’s like a war zone up there,” a Swedish journalist back from the Evros said to me later. His comment is not far from the truth; 47,000 migrants illegally crossed the 206km border between Greece and Turkey last year and the government cannot cope. In response George Papandreou, Greece’s prime minister, has mooted the possibility of a 12.5km fence on the land border (the River Evros makes up the rest of the 206km border) between Greece and Turkey to stop people getting in. Major NGOs including the UNHCR have condemned this idea, fearing that a fence would incur huge human costs and hurt genuine asylum seekers. But the human cost of crossing the border between Greece and Turkey is already high; 45 people died trying to cross last year. The role of the Greek police is to control immigration but often they are forced to rescue desperate migrants trying to cross the border. Salamagkas remembers last summer when rescue teams were sent to 42 migrants huddled on a tiny island on the River Evros; he says they were left there by people smugglers. As they waited the water rose around them, some tried to climb trees for safety. Others had cell phones and called relatives, who then called the police. Receiving the calls was terrifying, he says. 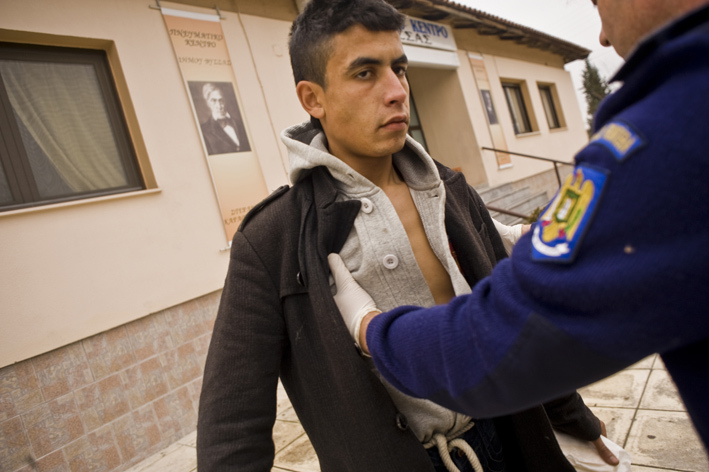 In October last year Frontex sent in 175 police officers from all over Europe to help Salamagkas’ men. The role of the RABIT (Rapid Border Intervention Teams) 2010 force is to “increase the control and surveillance levels at Greece’s external border with Turkey”. But what does this mean on the ground? 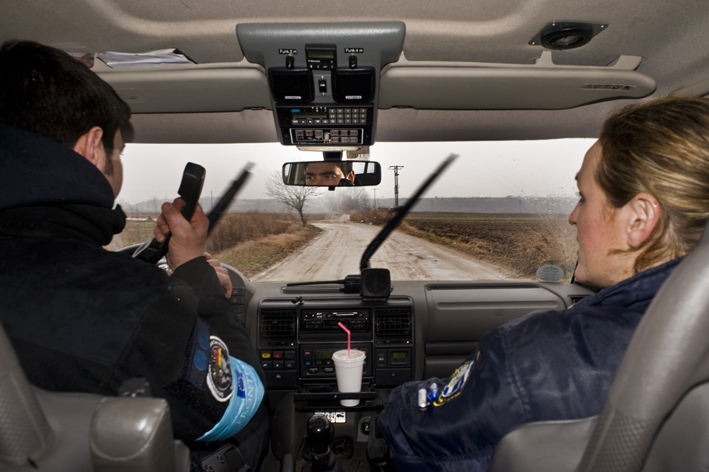 Frontex patrols are stationed in all the tiny towns that sit along the border; night and day the officers patrol the border waiting for migrants. One Greek police officer tells me that Frontex has made her job considerably less hazardous. “Just by being there,” he replies. So the EU’s border security is there to frighten away people trying to enter Europe illegally. But what if they aren’t afraid? The officer shrugs and says, “They stay and they try to convince us to let them come here to Greece. It is not our job to let them come through. Our job is to prevent them from coming here. It is too early to measure the success of the EU’s attempts to guard its border in Greece; but the fact is migrants are still getting in. I spoke to a Greek truck driver from Vrysoula who said on one occasion this year he’d seen a group of around 50 Africans are walking across the field behind his house. Christos Neradzakis’s detached house backs a series of undulating fields leading to the River Evros. His daughter Christine lives close by in a two-storey house he converted for her. Over the years both have witnessed hundreds of migrants making the journey from Turkey. They recount tales of half-naked migrants turning up at night and their village overrun with Frontex offices on patrol. Most of the migrants want to go to police because who they expect to turn up with papers and paradise, Christos explains. Like many villagers from the local border towns, illegal immigration is huge part of their lives. Often they feed and clothe the more desperate migrants; there is none of the resentment or hostility present in some European cities. Very interesting report Rebecca. Uplifting to see that many of the local Greek villagers do have a humane concern for the migrants. Did you happen to see Jenny Kleeman’s report for Unreported World which also looked at the issue of migrants crossing into the EU via Greece? No I didn’t, but I love Jenny Kleeman’s work. The last thing I watched of hers was about women being trafficked from Nigeria to Italy. Did you catch it?